This paper investigates the wealth of medicinal plants used by the Apatani tribe of Arunachal Pradesh. Apatani have traditionally settled in seven villages in the Ziro valley of Lower Subansiri district of Arunachal Pradesh in the Eastern Himalayan region of India. The present study has resulted in the documentation of 158 medicinal plant species used by the Apatani group of villages. These medicinal plant species were distributed across 73 families and 124 genera. Asteraceae was the most dominant family (19 species, 11 genera) of medicinal plants, followed by Zingiberaceae, Solanaceae, Lamiaceae and Araceae. For curing ailments, the use of aboveground plant parts was higher (80%) than the belowground plant parts in the Apatani group of villages. Of the aboveground plant parts, leaf was used in the majority of cases (56 species), followed by fruit. Different belowground plant forms such as root, tuber, rhizome, bulb and pseudo-bulb were used by Apatani as a medicine. About 52 types of ailments were cured by using these 158 medicinal plant species. The results of this study are further discussed in the changing socio-economic contexts. Tribal communities are mainly the forest dwellers who have accumulated a rich knowledge on the uses of various forests and forest products over the centuries. India possesses a total of 427 tribal communities, of these more than 130 major tribal communities live in North East India, which is comprised of the 8 states Meghalaya, Mizoram, Manipur, Tripura, Sikkim, Assam, Nagaland and Arunachal Pradesh. The major tribal communities of the North East India have been categorized into sub-tribes and if these sub-tribes are taken into account the total number of tribal groups reaches up to 300. In general, the tribes of North East India have been categorized into two broad ethnic communities, such as the Khasi and the Jaintia tribe of Meghalaya, who belong to 'Monkhemar' culture of Austoic dialect, and the rest of the tribal groups are basically Mongoloid, who belongs to Tibeto-Burman subfamily of Tibeto-Chinese group [1–3]. In the North East India, each state contains a number of tribal groups. Arunachal Pradesh is one of the states in North East India inhabited by 28 major tribes and 110 sub-tribes . Arunachal Pradesh is the 12th mega biodiversity region of the world . More than 545 species of orchids have been reported from the state, which is the highest number of orchid species known from any single state of India . Such a rich biodiversity in the state has provided an initial advantage to its inhabitants for observing, and scrutinizing the rich flora and fauna for developing their own traditional knowledge. Most of the tribe economies have been historically engaged in subsistence agriculture or hunting and gathering. Over the years, they have developed a great deal of knowledge on the use of plants and plant products in curing various ailments. A review of the literature reveals that many tribal areas and tribal communities in the eastern Himalayan region of India are either under explored or unexplored with regard to their floral wealth used in curing diseases. The Apatani is one such little studied tribe of Arunachal Pradesh . Therefore, a need was felt to gather in-depth information on the plant species used by this tribal group and suggest that similar studies need to be carried out across the various groups of tribes for comparison as well as for documenting the knowledge which may be under threat due to the influence of modernization. The present paper thus aims to highlight and record in detail the traditional knowledge of the Apatani tribe on the use of medicinal plant species growing in and around their settlements. Literally, the word Apatani is composed of two words- 'Apa' and 'Tani'. According to the local language, 'Apa' means display of affection and 'Tani' stands for human race. The Apatani, generally, speak in their own language which has no script. Traditionally, they had settled in seven villages (e.g. Hong, Hari, Billa, Dutta, Hija, Mudang-Tage, and Michi Bamin) those were organized in accordance with the traditional lines of the three forefathers called Nichi-Nitii, Tinii-Diibo-Dre-Hija, and Talyang-Hao. These 7 villages are located in the Ziro valley of Lower Subansiri district in the central western part of Arunachal Pradesh in India between 26°55' – 28°21' N and 92°40' – 94°21' E. The Ziro valley (often called the Apatani valley) lies between the Panior and Kamla (Kuru) rivers at an altitude of 1524 to 2738 m a.m.s.l. The Apatani group of villages is located at 2200 m elevation. The Apatani migrated to the present location from the Talle Valley located in south eastern region . The pattern of Apatani villages is that of string settlements (village houses are in a straight line) and homes are made of bamboo and timber. The Apatani belong to the Tibeto-Mongoloid stock, and trace their descent from one legendary ancestor, the Abotani. The Apatani believe in indigenous religion called as 'Donyi-Polo' and are patriarchal in social system. The traditional village council, which regulates and administers the community, consists of three bodies namely Akha Buliyang, Yapha Buliyang and Ajang Buliyang. In each of these traditional institutions has one or two persons represent from each clan. Earlier, the Apatani had prominent tattoo marks on the face to distinguish themselves from other communities settled nearby. However, the practice of tattooing has been discouraged in the recent past and now is on the verge of extinction. In 1991 census the population of Apatani was 22,526 (Table 1). The decadal (1991–2001) growth rate of the Apatani is 8.62%, which is much lower than that of the state (26.21%). The Ziro valley has an area of 1058 km2 of which 43 km2 is under agriculture, and remaining under forests, plantations and settlements. It is bounded with the areas traditionally belonging to neighbouring Nishi tribe. The land holding size varies from 0.02 to 10.00 ha with over 93% holdings consisting of 0.026–3.00 ha. The Ziro valley exhibits a humid sub-tropical to temperate type of climate with 108.1 cm rainfall and a temperature ranges from a maximum of 30.6°C to minimum of 1.1°C . The climatic, altitudinal and geomorphological variations have shaped the two major vegetation types in and around the study area- sub-tropical forests and temperate forests. Sub-tropical forests in the study area are represented by Castanopsis indica, Acer sp., Pinus wallichiana and Pinus roxburghii, whereas, the temperate forests are represented by Quercus glauca, Alnus nepalensis, Castanopsis indica, Pyrus sp., Prunus sp., Populus sp. and Acer sp [9, 10]. Many shrub species such as Berberis wallichiana, Viburnum foetidum, Prunus sp., Rubus sp., Spirea sp. and Symplocos sp. occur in the forested areas. A literature survey was carried out for compilation of existing information on the medicinal plants used by Apatani villagers [2, 3, 10–14]. In addition, field surveys in Apatani villages were undertaken during May and June 2005 to gather data on the indigenous uses of medicinal plant species by the Apatani. During the survey period, information was also gathered using semi-structured questionnaires on types of ailments cured by the traditional use of medicinal plants and plant parts used in curing different ailments. Cross-checking of data was made with the help of group discussions among different age classes of Apatani villagers that include both the genders of the society. The participant observation method was also employed to understand the methods and techniques adopted by the Apatani in curing diseases. The surrounding forested area and agricultural land of the Apatani villages were also surveyed with local youths and knowledgeable elders for the identification of various medicinal plant species and their indigenous uses. Since there is lack of comprehensive records on floral diversity of North East Himalaya including Arunachal Pradesh, the plant specimens were identified through various floral inventories [10, 13, 15]. The collected information was analyzed, and correlation was made between different genera and species of the medicinal plants in order to understand the pattern in medicinal plant uses and occurrences. The Apatani mainly subsist on agriculture and animal husbandry. Wet-rice cultivation is their most important agriculture practice. One of the Apatani proverbs reads "Tanii hii jebi danii", which means the Apatani depend on wet-rice cultivation. The Apatani have also developed a unique system of fish farming in their wet-rice croplands. They use available natural resources such as bamboo, cane, pine, Phragmites sp. and Castanopsis sp. in order to check the soil erosion, to conserve the soil fertility, to cultivate varieties of rice landraces, and to culture the fish in an integrated manner. Two species of bamboo (Phyllostachys bambusoides and Dendrocalamus hamiltonii) are also cultivated in private lands by the Apatani for construction of houses and other domestic uses. Bamboo shoots are also consumed by the Apatani as a vegetable. Apong, a locally prepared beer by fermenting rice, finger millet and barley, is an important beverage of the Apatani, which they prefer to consume with mutton. Domestic and semi-domestic cattle also play important role in maintaining the economic status of the Apatani. Possessing a large number of domestic animals is an indication of the prosperity of their respective owner . Mithun (Bos frontalis) is preferred mostly for the meat. In addition, pigs, cows, and multiple varieties of birds and fish are consumed by the Apatani. A number of wild edible fruits and vegetables are also collected by the Apatani from the nearby forested areas to supplement the domestic nutritional requirements. Traditionally, the Apatani group of villages was not only familiar with the knowledge of medicinal plants but they were also expert traders and met their necessities in exchange of paddy, which was always in excess of their requirements . Earlier, they had no connection with the plains of Assam due to obstructions created by the Nishi who were earning a lot by acting as middlemen between the Apatani and the people residing in the plains. However, the Apatani had occupied a compact area in Ziro valley and were one of the self-sufficient tribes in North East India . Their immediate dependence on nature had developed knowledge which ultimately is reflected in their traditional culture, religion, local belief, folklore, taboos language and dialects. For many centuries, the Apatani had kept alive a self-managed system of folk medicine that was mainly based on herbal remedies . Their ingenuity still reflects their traditional management and sharing of natural resources in a way that there is optimum utilization of such resources [8, 18]. The Nishi are one of the neighbours of the Apatani who live at lower elevations and are the most populous tribe in the state. Over the past few decades, the interaction between the Apatani and the Nishi has increased many fold due to migration of Apatani people in search of better education in Itanagar, a capital of Arunachal Pradesh. The availability of motor roads and the invasion of modern civilization have also enhanced the day to day interaction and the exposure of the Apatani to the rest of the world. Such interaction has provided a possible sharing of traditional knowledge of the Apatani with their neighbouring community. During the present course of investigations, a total of 158 medicinal plant species used by the Apatani group of villages were documented. These medicinal plant species were distributed across 73 families and 124 genera (Table 2). In terms of number of medicinal plant species, Asteraceae was the most dominant family (19 species, 11 genera) of medicinal plants, followed by Zingiberaceae, Solanaceae, Lamiaceae, Araceae, and Verbanaceae (Table 3). 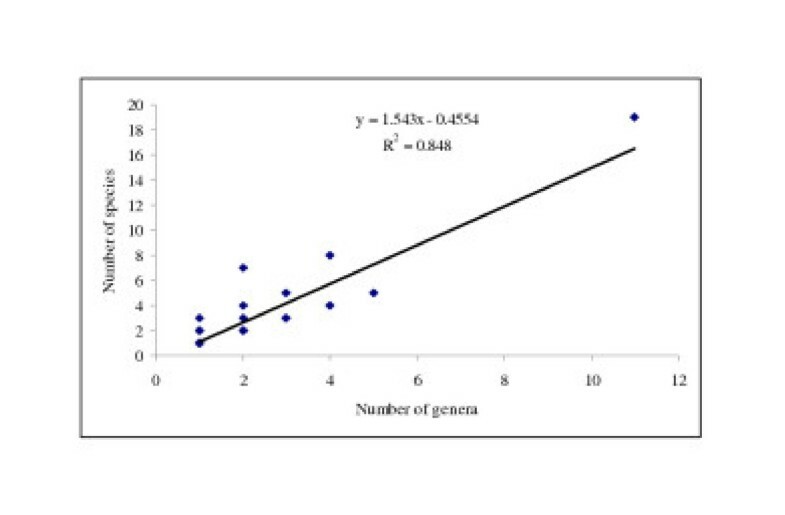 There was a significant positive correlation (r = 0.92, p > 0.01) between the number of genera and number of species used as medicine by the Apatani (Figure 1). The invention of maximum number of uses of Asteraceae by the Apatani tribe demonstrates the dominance of Asteraceae around the Apatani group of villages. Asteraceae is the most dominant family of medicinal plants across the North Eastern States of India . Clerodendrum glandulosum Coleb. ex Wall. Cyathea gigantea (Wall. ex Hk. f.) Holt. Dicranopteris linearis (Burm. f.) Und. Gynura biscolor (Roxb. ex Willd.) DC. Hedychium spicatum Buch.-Ham. ex Sm. Hypericum japonicum Thunb. ex Murr. Miliusa roxburghiana (Wall. ex Griff.) Hk. f. & Th. Myrica esculenta Ham. ex D. Don. Plectranthus japonicus (Burm. f.) Koidz. Relationship between genera and species richness of medicinal plants used by the Apatani in Ziro valley of Arunachal Pradesh. Different parts of medicinal plant species were used by the Apatani as a medicine. For curing ailments, the use of aboveground plant parts was higher (80%) than the belowground plant parts. Of the aboveground plant parts, leaf was used in the majority of cases (56 species), followed by fruits. Different belowground plant forms such as root, tuber, rhizome, bulb and pseudo-bulb were also used by the Apatani as a source of curing ailments (Table 4). The whole plant of 3 species [e.g. Curcuma aromatica Salisb., Cuscuta reflexa Roxb. and Dicranopteris linearis (Burm. f.) Und.] was used as medicine. These 158 medicinal plant species were used in curing about 52 types of ailments, of which the highest numbers of plant species (40 species) were used for the treatment of gastrointestinal disorders such as indigestion and constipation. About 19 medicinal plant species were used in curing cough and cold, and 15 medicinal plant species were used for healing cuts and wounds (Table 5). Previous studies carried out in North East India have reported 41 medicinal plant species used by the Apatani of Arunachal Pradesh . However, they had selected many North Eastern States and 12 different tribal communities for investigations. Based on their experiences, they had suggested the need of carrying out detailed investigations of each tribe. So far different authors have reported 1350 species of plants used in ethnomedicinal preparations, 665 species of food plants and 899 species for miscellaneous uses from the entire North East India . The present inventory of 158 medicinal plant species as used by the Apatani is one of its kinds in terms of the highest number of species recorded so far used by a single tribe of the North East India. This fact provides a strength to the statements of earlier researchers that North East India is still under-explored and certain areas in the district of Subansiri still remain unexplored [3, 10]. Hence, a need for detailed investigations of ethnobotanical knowledge held by each tribal community in North East India is required before such valuable knowledge vanishes. In spite of the rich wealth of bio-resources and potential, development is far from meeting the expectations of local people in Arunachal Pradesh mainly in terms of existing health care facilities and herbal industries. Ethnomedicinal knowledge is also important from a humanitarian point of view in that in long run as this knowledge may help to identify important medicinal uses that can help in curing and healthcare around the world. Attempts should be made to share the benefits arising from such knowledge with its holders. The present inventory of medicinal plants used by the Apatani opens new avenues to scrutinize such a rich natural resource for further analysis in order to develop the potential of herbal medicine. I thank Director, G.B. Pant Institute of Himalayan Environment & Development, for providing logistic support. I extend my thanks to Dr. Pitamber P. Dhyani, Dr. Drupad C. Choudhury, Dr. Rakesh C. Sundriyal, Dr. Nehal A. Farooquee, Dr. Manju Sundriyal, Mr. Mihin Dollo, and Mr. Rubu Bukar for helping in various ways during the course of this study. Dr. M.S. Rawat is thanked for discussions on the subject matter. I acknowledge the help provided by all the Apatani group of villages during the fieldwork. Dr. Andrea Pieroni and three anonymous referees are thanked for their constructive comments on earlier drafts of the manuscript.